This newsletter I would like to tell you of a delighting event that happened to Yaron, the shop manager with whom many of you correspond regarding questions and orders. 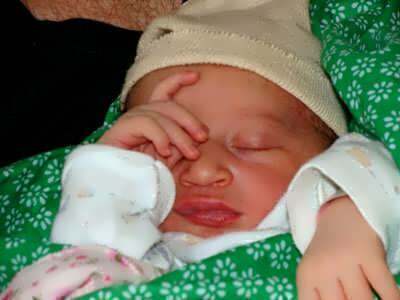 On the 7/7/2010 on 5 AM a daughter was born to him, having already a son and two more daughters. It is hard to believe that his daughter was born in the car on the way to the maternity ward, after only one and half to two hours of contractions. The baby was received by his wife's sister who was sitting with the mother in the back seat. 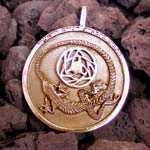 The time of the birth fell minutes before the preparation of the cancer zodiac pendant. 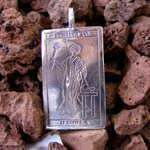 I remember that I prepared only 7 pendant and was considering stopping the process when suddenly, from no where, a thought arose that exactly now, at this special time, a new person was born and I determined to create an additional pendant. Few minutes later I received an SMS from Yaron that the baby was born. The baby was born whole and healthy with an astrological signature. The current newsletter also contains new designs with 14% discount and a new contest that we are doing for our clients only. 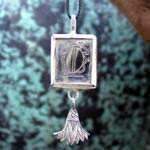 At the top of the pendant engraved - Behold the Glory of the first Cause.- In the center of the pendant appears a version the Triquetra. 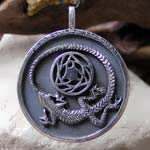 Around the symbol appears the Ouroboros in the form of a Lizard that swallows its tail. 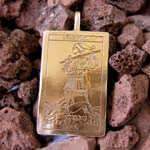 The Divination pendant has been created especially to endow you with understanding of time and the ability to develop divination. 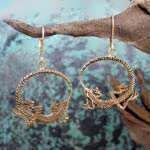 The symbol in the earrings is the symbol of the Ouroboros in the form of a lizard that swallows its own tail. The Ouroboros is one of my favorite symbols as it represents the whole universe changing in front of our eyes. 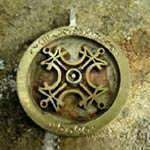 The sun talisman is a unique Talisman that is based on ancient esoteric scripts. In the center there is the symbol of the sun in gold. Around it there are ancient magical signatures of the sun. The sun talisman brings power, life and light into the wearer's life. The pendant will be composed on the 25th of July at sunrise. There will be a limited number of pieces so it would be best to order in advance. This is only the design picture. The actual items will be made at 25th of July. This series of pendants is part of the cooperation with British artist Karyn Easton which created a lovely set of Tarot cards. The pedants were manually engraved according to Karyn cards by my brother the artist engraver – Jonathan Weitzman. 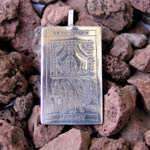 Following are the first three cards pendants in the series. The Fool – a journey card. Encourages the journey, both external and internal. The Magician – symbol of the ability to reach fulfillment. The Chariot – The card of struggle and victory. Encourages the wearer to continue and not give up. We added new set of Zodiac earrings. 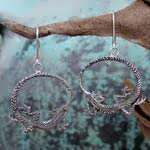 We have all 12 zodiac earrings. The Symbols engraved are the Egyptian signs of the zodiacs. Limited edition (only 8 made). Contest prize – Gold jewelry, of your selection, up to $400 worth!!! We decided to have a contest, between our customers, for the best testimonial Movie. All you have to do is to film yourself, telling how you got to our website, what most impressed you, how was your experience with customer service and the most important – what was your experience when you received and wore the jewel on you. 1. Film yourself wearing the jewel and tell of your experience. 3. Share the movie in our Facebook page and other social networks.